The American Express Platinum Card has seen a number of changes recently, for both the better and worse. On the downside, as of March 21, 2014, the Platinum Card no longer provides access to either American Admirals Clubs or US Airways Clubs. 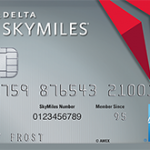 In addition, complimentary lounge access to the Delta Sky Club is restricted to only the cardholder, whereas in the past up to two guests could be admitted for free as well. On the plus side, this month, American Express increased the signup bonus for the Platinum Card to 40,000 points for spending $3,000 in 3 months–up from the 25,000 points for spending $2,000 in 2 months that it was previously offering. Last week, it also announced two new benefits that will start in June 2014: complimentary, unlimited access to Wi-Fi hotspots provided by Boingo Wireless, as well as an application fee statement credit option for the TSA Pre✓™ program. Starting June 2014, Consumer, Business and Corporate Platinum Card Members will receive complimentary access to Boingo Wi-fi. The plan provided by American Express provides access to land-based Wi-Fi services and does not include in-flight Wi-Fi. For a complete listing of Wi-Fi hotspots in Boingo’s network, visit http://wifi.boingo.com. Also beginning in June 2014, Platinum Card Members will have the option to receive a statement credit for a TSA Pre✓™ application fee. The $85 statement credit for TSA Pre✓™ is an alternative to the existing benefit that American Express launched in 2011–a $100 statement credit for a Global Entry application fee. Card Members can receive a statement credit for either the TSA Pre✓™ or Global Entry program application fee once every five years. If the Card Member does not travel internationally or does not think he/she meets the requirements of Global Entry, the Card Member can opt to apply for TSA Pre✓™ alone. TSA Pre✓™ allows low-risk travelers to experience faster, more efficient screening at participating U.S. airports. With these changes, is the Platinum Card worthwhile? With its hefty annual fee of $450, the Platinum Card always had a narrow target audience–those who wanted access to a wide range of travel perks, and were willing to pay for it. With some of those perks going away, it’s a fair question to ask whether the card is worthwhile. As a points-earning card, after all, it’s inferior to other travel-oriented cards such as the Barclaycard Arrival World MasterCard, which effectively earns a 2.2% rebate on all purchases with a much lower annual fee of $89. Any realistic valuation of the Membership Rewards points that the Platinum card earns falls well short of that mark. So, what are some of the key benefits of the Platinum Card? Airport club access – Cardmembers are granted complimentary access to over 600 airport lounges worldwide through Priority Pass Select. In addition, Platinum Card holders have access to Delta Sky Club lounges and the new Centurion Lounges that American Express is opening. Current Centurion Lounge locations are in Las Vegas and Dallas Fort Worth, with plans to open locations in San Francisco and NYC La Guardia. $200 airline fee credit – Enroll and select a qualifying airline to receive up to $200 annually in statement credits for incidental fees, such as checked bags and airport lounge day-passes, charged by the airline. Starwood Preferred Guest Gold – As a Platinum Card Member, you can upgrade to Starwood Preferred Guest® (SPG) Gold Status without meeting any stay requirements. Normally you need 10 eligible stays or 25 eligible nights in a calendar year to earn Gold status. As a Starwood Preferred Guest® Gold member, you’ll earn 3 Starpoints® for every eligible U.S. dollar spent at SPG properties—a 50% bonus over Preferred Guests—so you receive free nights faster. Gold status also allows you a 4pm late checkout, an enhanced room at check-in, when available and your choice of a welcome gift with each stay–choose from bonus Starpoints, complimentary in-room Internet access or a complimentary beverage. Global Entry fee credit – Global Entry is a US government program that allows expedited clearance for pre-approved travelers. When you use your Platinum Card® to apply for Global Entry membership, you’ll be credited back the $100 application fee, and if approved, your membership will be valid for 5 years. Additional Platinum Card(s) are also eligible for the $100 statement credit. As previously stated, starting in June 2014, Platinum Card Members will also have the option to receive a statement credit for a TSA Pre✓™ application fee instead. No foreign transaction fees – Pay no foreign transaction fees on international purchases with the Platinum Card. The Platinum Card is also available with “Chip and Signature” or EMV technology, upon request, for an extra level of security. There are quite a few more benefits, such as access to the Fine Hotels & Resorts program–which offers a number of deals on high-end properties–as well as the premium companion ticket and premium car rental insurance programs. Are all of these perks worth $450/year? For most people, the answer will be no. But the card should still appeal to a select few who will be able to get more value out of these benefits. For more information on the benefits of the Platinum Card, visit www.americanexpress.com/Platinum.